The exact moment may have been lost in the midst of time, but the decision or suggestion to get Horace Andy in to collaborate with Massive Attack pretty early on was one of those ideas of total genius, like getting Peter Falk in to play himself in Wim Wenders’ Wings of Desire. Horace Andy has such an eerie, unearthly perfect voice. He is almost a ghost-like presence on the great Massive Attack records, providing echoes of old Studio One tunes, like 'Skylarking', 'Spying Glass', 'Money Money', and 'You Are My Angel', drifting in and out of the rhythmic mix like a benign spectral presence. 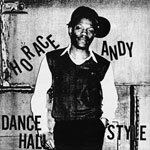 One of the absolute joys of my life was finding in the late ‘80s a copy of Horace Andy’s 'Oh Lord Why Lord' on a 7” which I got for 10p in the days when the basements of Record And Tape Exchange were filled with abandoned singles. It was a great time to pick up lost gems like the Disco Dub Band’s mutation of 'For The Love Of Money', the Peppers’ 'Pepper Box', and the Soul Runners’ 'Charley' for next to nothing. My copy of 'Oh Lord Why Lord' had the label scratched off, and just the credits typed on – literally typed on somehow. And what a beautiful recording it is! What I didn’t realise at the time was that it was a Parliament song, from their first LP, with a co-credit by Ruth Copeland, our girl from the North Country, and based on a sacred religious tune oft appropriated in pop. Partly as a result of the compilations that followed on from his appearances with Massive Attack, now Horace Andy’s performance of 'Oh Lord Why Lord' can be heard again. I have it on a Studio One selection called Mr Bassie. The title track reminds us that in its Augustus Pablo version, 'Mr Bassie' was one of the earliest Rough Trade singles, and in the mid-‘80s Horace Andy himself would record an LP for the label. This would have followed on from a series of records Horace Andy made for the legendary New York label Wackies. Alongside classic recordings by the likes of Wayne Jarrett, Lovejoys, Junior Delahaye, Sugar Minott, and complementary adventurous dub excursions, Wackies put out some of the best ever Horace Andy sets, and certainly Dancehall Style and Exclusively in salvaged forms sound superb. And interestingly one of the things that once irritated me about reggae, which is the endless revisiting of old refrains and rhythms, is one of the more appealing aspects of these Wackies sets, again suggesting this idea of Horace Andy as a ghostly voice echoing not just through Massive Attack's catalogue. The Berlin-based Basic Channel outlet has been carrying out a superb salvage operation of Wackies releases, and all the CDs are immaculately packaged in stark digipacks. You would expect nothing else from the Basic Channel organisation. The label may have been avowedly committed to preserving vinyl, but its presentation of CD releases has been brilliantly unique. It’s something the Ghost Box operation understands too. The CD compilation of early Basic Channel minimalist techno infestation came defiantly clad in a plain cardboard cover, with a dearth of information. As the label evolved into Chain Reaction, the CD releases initially came uniformly in a metal tin, plainly projecting the label name, barely mentioning the artists’ name, leaving the often amazing electronic music inside to speak for itself. And these tins allegedly destroyed the music inside, but they looked great. These early Chain Reaction CDs included ones by Vainqueur and Various Artists. The latter’s Decay Product set made explicit connections to the dub traditions at the heart of the Basic Channel ethos. In a famous Kodwo Eshun article for The Wire, Various Artists’ Thorsten Profrock says: “Dub was a kind of resonance to my soul because everything I like within techno music, all these effects, these dub people had it. You see a line between dub and Basic Channel”. The true realisation of this approach would come on the almost 20-minute suite that is his 'No. 8' – a uniquely absorbing road movie of a track – and its successor 'No. 9' which were recorded for the London-based Fat Cat label. Another, slightly later, classic Chain Reaction set was Mutila by Vladislav Delay, a Finnish innovator and jazz percussionist who no doubt reluctantly became a leading light in the clicks and cuts, microhouse or glitch, electronic scene. The fascinating thing about this music was its seemingly self-contained life completely outside the mainstream, but occasionally you would hear an unexpected r’n’b or dancehall track and find strange connections that seem to have come from nowhere. Basic Channel’s guiding spirits, the purposefully anonymous and therefore exceedingly enigmatic Mark Ernestus and Moritz Von Oswald (Maurizio), would retreat further inside the dub organism as Rhythm & Sound, explicitly connecting the techno twitches and throbs with the dub decays and delays, the exaggerations and extractions. It is no coincidence surely that the outlet for this, Burial Mix, would be a massive influence on some of the participants in the bass continuum for years to come. Just as the space and echo of dub transplanted to an industrial Berlin would conjure up images of abandoned warehouses and desolate factory spaces, rather like the music of Joy Division and Martin Hannett captured a decaying Manchester now disappeared, so new variants like dubstep captured the conflict between inner city disease and desire. Just as Basic Channel/Chain Reaction helped invent the future, so Maurizio and others still active in the German electronic underground have links back to the new wave of sounds that punk inspired. Maurizio, for example, played in the legendary Palais Schaumberg with Thomas Fehlmann, albeit after the immortal David Cunningham-produced debut and after the departure of Holger Hiller. Hiller himself would be also be a recurring figure in odd places where electronic adventuresomeness was taking place, and occasional solo sets are highly recommended (the presence of Billy MacKenzie on 'Oben Im Eck' is surely enough to encourage investigation? ), and the Hiller name occurs in the credits for the likes of Renegade Soundwave and Chicks On Speed. Almost running parallel to Palais Schaumberg were Liaisons Dangereuses and Malaria! And from these outfits Beate Bartel and Gudrun Gut would continue to make the case for electronic exploration long after they were in a very early incarnation of Einsturzende Neubauten, and after they worked together as Matador where they very deliberately set out to empower women to experiment with electronica. Gudrun still runs the excellent Monika label, home to some of the best pop music around, with Barbara Morgenstern and Cobra Killer among others. And Horace Andy is still somewhere singing: “You live in the city. You mind your own business. What you see you don’t see. But some people they always see. They never mind their own business”.